Although Toyota has had the Etios and the Corolla Altis on sale for a while now, they haven’t had a representative in the C-segment sedan class until now. The Japanese car maker is all set to bring in the new Yaris next month. Being a bit late to join the party, Toyota will have a tough task to establish the Yaris against some its competitors. Thankfully, the Yaris is up for the task. In comparison to the rest of the cars in the discussion, the Toyota Yaris is not only marginally shorter in length but also has a smaller wheelbase. 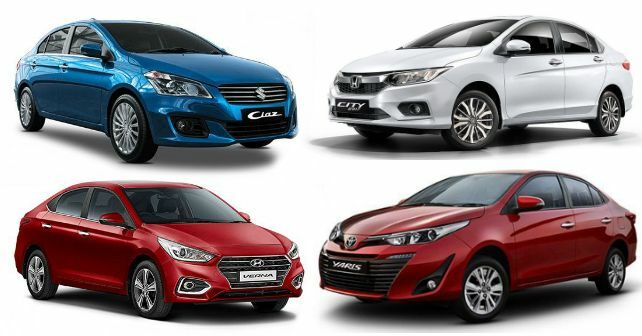 That being said, the Japanese offering is the widest of the lot alongside the Maruti Suzuki Ciaz. One aspect where the Yaris really falls behind is the ground clearance. At just 133mm, the Toyota offering sits really low to the ground and always runs the risk of scraping its underbelly over large potholes and speed breakers. Toyota will only be bringing the Yaris with a petrol engine option to start with – a diesel motor may be plonked at a later date. Toyota sells the Yaris by the Vios name in a few south-east Asian countries. The Yaris and the Vios are essentially the same cars with the same heart underneath the hood. As of now, Toyota has forbidden us from letting out the specs for the India-spec model, and with that in mind, we shall consider the specs of the Singapore-spec Yaris. At 108bhp, the Yaris is not as powerful in comparison to the Honda City and the Hyundai Verna 1.6 but it must also be noted that the weighs marginally less too. That being said, in comparison to the Ciaz, the Yaris is noticeably more powerful. Also, keeping in mind it will come paired with a 6-speed manual or a 7-speed automatic transmission, expect the Yaris to be a judicious sipper too. The Yaris comes with ABS, EBD, 7 airbags, projector headlamps and cooled glovebox as standard across all variants, which is a segment first. More segment firsts include disc brakes on all four corners, electrically adjustable driver seat, and front and rear parking sensors. Additionally, the Yaris also comes with a touchscreen infotainment, rain sensing wipers, cruise control and LED DRLs. The Honda and the Toyota are the only two cars in the segment to come with Hill Start Assist. Toyota is about to launch the Yaris in India on May 18. To enter the segment on a high note, Toyota is expected to price the base trim affordably but considering the features it has on offer, the top-spec trim is likely to demand a premium. We expect Toyota to price it in the Rs 8.5 lakh to 11.5 lakh range for the petrol trim.